When I bought the Mattress Factory building 35 years ago, I had no idea that this is what it would end up being. 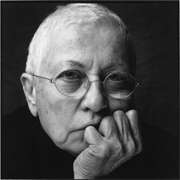 I was looking for a new space, because I had just had a show at the Carnegie Museum and I was seeking a bigger studio. As a sculptor, I envisioned a place where I could work with other artists, because at the time, Pittsburgh didn’t have a strong identity as a city with a community of artists. I came across this huge empty building, which had formerly been a Sterns & Foster mattress factory. In the very early days, artists rented studios throughout the building, and we started a vegetarian co-operative restaurant to bring many different people together. We had a little bit of everything, good food, performance art, visual art, experimental theater, even a children’s theater group. There was a lot going on all over the place. It was a true collaboration. I had absolutely no recognition, at all, that I was biting off more than I could chew. I just did it anyway. I didn’t have some grand vision all those years ago—I was just trying to create a place where I wanted to be, with other creative people. That place didn’t exist, so together we made it happen. Even as we began to focus on installation art, we didn’t set out to become a museum. It happened organically. It came out of the energy of the art—the intersection of art and sculpture and architecture and sound and space and light. There wasn’t an end destination in mind. It has always been about the journey. I got sucked in because it was a challenge, and it was a way to combine my interests in contemporary art, architecture, design, community development, and collaborating with other artists. When people said it couldn’t be done, we did it anyway. If we stumbled upon a problem, we went about solving it our own way. Join us Friday, June 21 for the Mattress Factory's signature fundraiser, the Urban Garden Party, chaired by Anne and Anuj Dhanda. 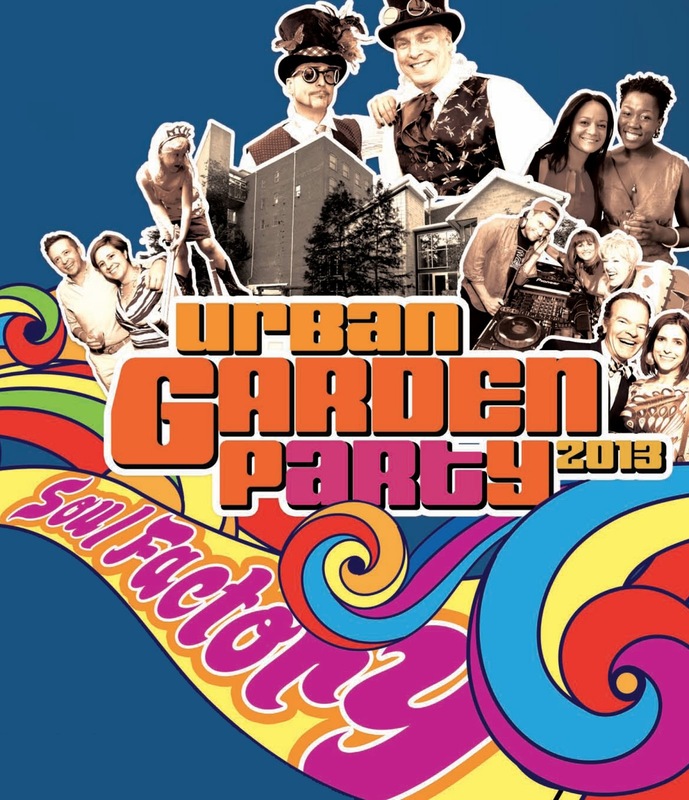 The Urban Garden Party is the premier social event of the year, drawing more than 1,300 attendees to help support the museum's mission in a festive atmosphere. Marking the museum's 35th year in Pittsburgh's North Side in 2013 and looking ahead to our fall exhibition, Detroit: Artists in Residence, we look back to the innovative drive and unrelenting spirit surrounding our founding decades ago and recognize a kindred spirit in Motown--a place, a people and a sound that move us to celebrate ingenuity. Come groove the night away with us and toast to the creative minds that have become the heart & soul of the city! General admission tickets get you into the hottest party of the year in the Mattress Factory's unique garden, with live entertainment, open bar, fare from over 40 food vendors and hobnobbing with Pittsburgh's art elite! VIP tickets open the doors to the exclusive VIP pre-party from 6 - 7:30pm, and then offer you access to the VIP Lounge--including a private bar, restroom and courtyard for VIPs only--throughout the night. Tickets sell out each year so don't wait! All proceeds benefit the Mattress Factory’s artistic programs, exhibitions & education outreach. The Mattress Factory is always interested in engaging new audiences and thinking about creative ways for our visitors to engage deeply with our collection and the idea of space. We are also interested in thinking about technology and using it as a tool to challenge visitors to think and experience our space in new ways. This has led to a new project that is made possible by an IMLS (Institute of Museum and Library Services) Sparks! Ignition grant. The first phase of the project is research and content development for an iPad application called You Are The Artist! for children ages three to six years old. The app will encourage young people to “think like an artist.” The app we will build is not going to be a tool to quiet and entertain students. Instead it will require engagement between the child and parents, grandparents or siblings. The app will also ask the child to look more closely at the world around them and begin to understand how different spaces make them feel and how they can impact the space around them in the world. We have just begun our research and are very excited about the enthusiasm and response we have received from our community. Many families have graciously donated their time to come and visit the museum and speak with our Museum Educators about that experience. We also hosted an Educator Evening where we invited Pre-K and Kindergarten teachers to tour the galleries and give us feedback about how they think their students would respond to our permanent installations. We hope to learn more about the questions that parents, students and teachers have for each other while experiencing the Mattress Factory installations. We are gaining a fuller understanding of the learning that takes place in the galleries and how we can deepen that conversation through an iPad app. The Education Team also hopes to use this valuable research and create other programs and materials for this age group. Experiencing the Mattress Factory at such a young age is an incredible experience and we hope to have more programming focused for 3-6 year olds soon. 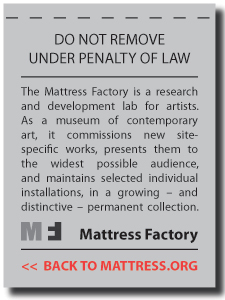 In the meantime, if you are interested in helping us with our study, have been to the Mattress Factory and have young children, please take a moment to fill out a brief questionnaire.